Rinat Shabayev, 23, said he helped code the program that security experts think was eventually modified and used against Target but that it had a defensive purpose as well. 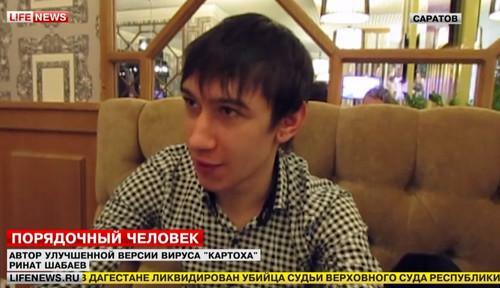 In a surprising TV interview, a 23-year-old living in Russia said he helped code a software program that experts believe was eventually modified to steal tens of millions of payment card details from Target. Rinat Shabayev, who lives in Saratov, Russia, told Lifenews.ru that the program has a defensive purpose of finding software problems but could have been abused by criminals. The news outlet characterized his work on the program as a side job, quoting him as saying, "I am trying to find work. I want to find a normal and stable job and time to start my own business." Efforts to reach Shabayev through two email addresses and a social networking profile were unsuccessful. It didn't take long for a media outlet to track Shabayev down in person. On Monday, he was publicly named in a news release from IntelCrawler, a Los Angeles-based security firm that specializes in collecting intelligence from password-protected forums where hackers lurk. IntelCrawler roiled the security community after it named a teenager last week, and then Shabayev on Monday, as part of a group that created the Kaptoxa or BlackPOS malware, a version of which was used by others against Target. Analysts disputed IntelCrawler's findings but offered no alternative explanations. The teenager, whom IDG News Service has not named, has denied the accusation in the media. Neither of the two has been arrested or charged. Shabayev, who used the nickname "ree4" in underground forums, left a smattering of clues, including using his online nickname on a Russian-language community forum and a freelance work job site. "He did a terrible job concealing his identity," said an industry cybercrime expert investigating the Target breach who has followed Shabayev since last year. The expert translated the Lifenews.ru report for the IDG News Service. "Coding" is listed as one of Shabayev's interests on the Vkontakte social network, where his profile photo shows him in front of a microphone, playing bass guitar. There, his last name is spelled "Shabaev." On a community forum website, Shabayev has his hair in a mohawk while leaning against a brick wall, smoking. Shabayev's argument that he contributed to making a security tool rather than a hacking tool is a clever point. Like an ordinary hammer, software tools can be abused depending on how they are used. To find holes in their networks, security experts often use powerful software tools that in other hands could be harmful. Metasploit, for example, is a penetration testing tool frequently used by hackers but also used legally to see if applications are defenseless against the latest software vulnerabilities. Experts doubt the two named by IntelCrawler had a hand in actually stealing the data from Target, which said 40 million cards and 70 million personal records were compromised between Nov. 27 and Dec. 15, the busiest shopping time in the U.S.
And it's unlikely Shabayev will be able to offer more insight into the Target attack. Underground forum postings seen by IntelCrawler show the malware, which intercepted unencrypted card details at Target's point-of-sale terminals, was sold at least 40 times, posing a challenging digital trail for researchers to follow.